Scientists at the University of Liverpool have developed a free iPhone application to help health authorities monitor cases of major infectious diseases in response to research that highlighted one in 10 meningitis patients were not reported to the Health Protection Agency (HPA). Doctors with a meningitis patient, for example, can open the app to read guidelines on how to best to manage the patient, such as which antibiotics to prescribe. The app simultaneously sends the doctor’s grade, speciality, and hospital location to a central database. By answering a simple question at the bottom of the screen the central database is made aware of the doctor’s GPS location and how the patient is being managed. The aim of the new app is to create a real-time global disease surveillance database that allows researchers to track disease across the globe and collect valuable data on clinical practice. The app, in its first month, has already reached more than 1000 users, with diseases reported from all over the world. Dr Benedict Michael, a National Institute for Health Research (NIHR) Doctoral Research Fellow at the University’s Institute of Infection and Global Health, said: “Notification of many major infectious diseases is required from junior doctors, who are often unaware of which cases to notify, who they are supposed to notify, and how they are supposed to do it. “Even those with adequate knowledge of the process, can find it time consuming when also dealing with the welfare of their patient and other important administrative duties. “In order to improve the quality of health care, however, and understand the spread of infectious diseases, like meningitis, notification to the proper authority is crucial to make sure that we continue to provide a world-class health service, including tracking and responding to the threats posed by the spread of new and resistant infections. The app is quick and easy to use for doctors who are constantly on the move and performing multiple duties; it is simply a click of a button, rather than pages of paper work. The app also pulls together guidelines across medical fields and health groups, such as the World Health Organisation (WHO) and the National Institute for Health and Clinical Excellence (NICE), with the aim of collecting important medical data. This includes where in the country patients admitted with suspected heart attacks get clot-busting treatments; where in the world there have been disease outbreaks; and charting drug-resistant viruses. 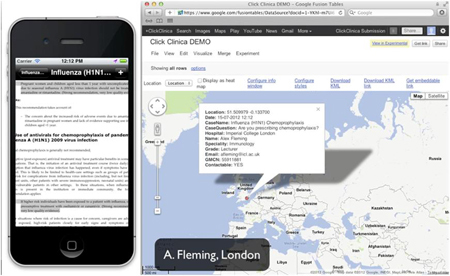 Medical professionals can download the app to their iPhones by searching for ClickClinica.